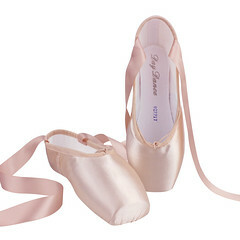 The Aloart canvas model pointe shoe is truly a lightweight, professional pointe shoe. Holding the shoes in my hand, they felt as light as butterfly wings. I can see how a professional dancer would be able to have the highest freedom of movement in pointe shoes designed this way. The toe box on the XWB 1001 is very firm and strong, and yet the rest of the shoe can be bent back upon itself like a ballet slipper. 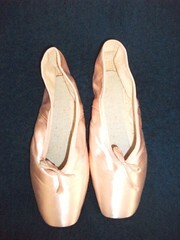 Many dancers spend time removing the last quarter or half of their pointe shoe shanks to achieve this same flexibility. The XWB 1001 has a strong, sturdy shank that ends at the natural curve of the arch. 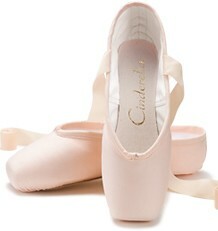 As soon as I put these shoes on I was able to pointe my foot completely and the shoes hugged my arch closely. The vamps measure approximately 4 inches in length from the edge of the drawstring casing then down across the entire platform to the platform end. The platforms are 1 and 3/4 inches wide and approximately 1 inch tall. The vamp length would work well for medium to short toes. This model comes with an elastic drawstring. The Aloart XWB 1001 in canvas makes an excellent rehearsal or practice pointe shoe for professional dancers. 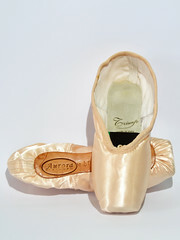 This entry was posted in Pointe Shoe Images and tagged Aloart pointe shoes, Aloart XWB 1001, canvas pointe shoes, Italian pointe shoes, lightweight pointe shoes, Pointe Shoe Brands, Pointe Shoe Images, professional pointe shoes. Bookmark the permalink. I love the pre-arched shape. Interesting that they come in canvas. I hope this brand gets U.S. distribution someday. Hello I love your articles! 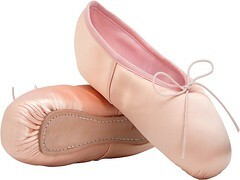 I am interested in this canvas pointe shoes. Where did you purchase it? Thank you for visiting. I am happy to hear that you love the articles. Since it has been so long, they may not sell them anymore, but it’s worth a try. Good luck! Thank you for you kind information. Unfortunately, I have not hard from thm yet. 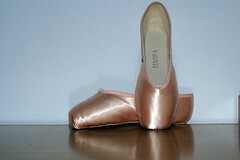 Howeever, I am really lucly to find your articles, especialy about pointe shoe maker in Italy. I love Italian shoes for town shoes. 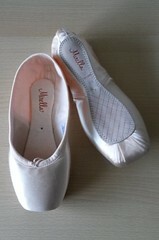 So now I am exicited to have a chance to try my first Italian pointe shoes for dancing. Thank you again for your valuable information!